LayerZero Power Systems Static Transfer Switch technology has been well-established as the benchmark in the mission-critical power distribution industry, having developed an array of innovative technologies that enable exceptionally high power reliability at continuously growing densities. 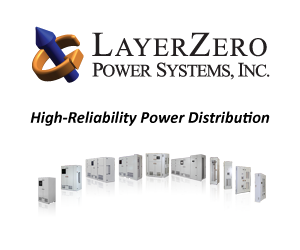 LayerZero designs the highest-quality power distribution products to the exact specifications that our customers demand, constantly improving on our processes to provide power reliability that is unrivaled by our competition. LayerZero products provide fast power switching capabilities, safety-focused designs, open interconnectivity, and information-centric power quality monitoring options as standard functionality. When specifications require top-of-the-line solutions and professional installations, LayerZero Power Systems products provide an optimal solution.